Nearly twice as many Americans have been killed by right-wing extremists since 9/11 as have died at the hands of radical Muslims on US soil, a new report found. 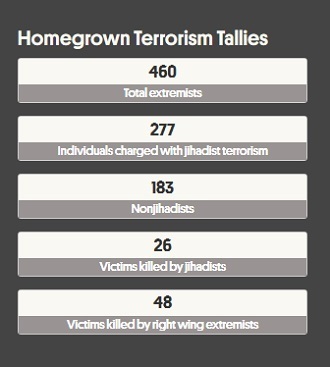 There have also been nearly three times as many deadly right-wing attacks as jihadist ones. In almost a decade-and-a-half, 48 Americans have died in the US in 19 attacks by white supremacists, so-called “sovereign citizens” and other non-Muslim extremists, while 26 have died in seven jihadist attacks on US soil during that same time period, research center New America found as it compiled a new database on deadly attacks in the US since 9/11. "Since 9/11, our country has been fixated on the threat of jihadi terrorism," said Richard Cohen, president of the Southern Poverty Law Center, according to the Kansas City Star. "But the horrific tragedy at the Emanuel AME reminds us that the threat of homegrown domestic terrorism is very real." Last Wednesday, nine African-Americans were shot and killed at Emanuel African Methodist Episcopal Church in Charleston, South Carolina. Dylann Storm Roof, who later confessed to the massacre, made racist statements as he killed his victims, survivors told police. A website believed to belong to Roof contained a white supremacist manifesto, as well as photos of him posing with a gun, carrying the Confederate flag and burning an American flag. The Charleston shooting has not been officially labeled as terrorism, however, and Roof has not been charged with any crimes more heinous than murder. The New America database shows that attacks like Roof’s are a much more common occurrence than those like the 2013 Boston Marathon bombings, in which Muslim brothers Tamerlan and Dzhokhar Tsarnaev killed four people and injured over 260 more in a religiously motivated attack. 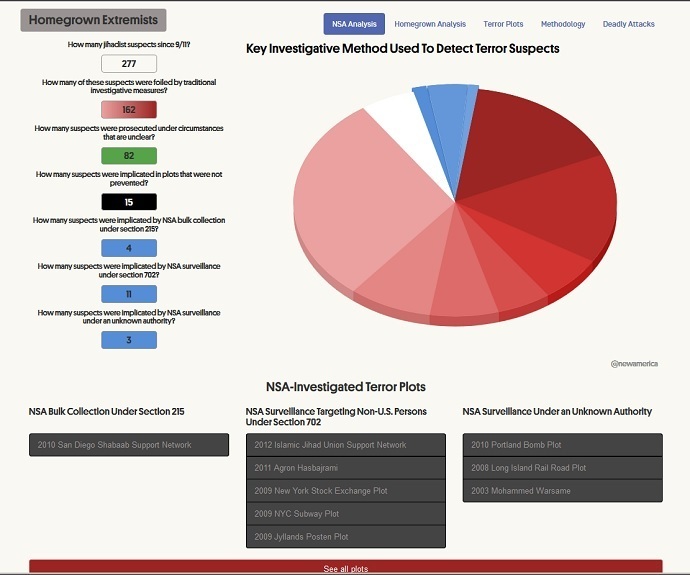 The dataset ‒ compiled by David Sterman, a New America program associate, and overseen by Peter Bergen, a terrorism expert ‒ relied mainly upon court documents, wire service reports and news reports as sources. A small number of individuals who either died or were killed without being charged, and are widely and credibly reported as having engaged in violent extremist activity, were included in the list of charged extremists. There were killings that gripped the national conscience but were not included. A North Carolina man who confessed to killing his three Muslim neighbors and had posted angry critiques about religion online, for instance, was omitted because the shooting may have been related to a parking dispute. Likewise, New America did not include massacres that did not appear to have ideological motives, such as the Aurora, Colorado movie theater shooting or the Sandy Hook Elementary School shooting in Newtown, Connecticut. 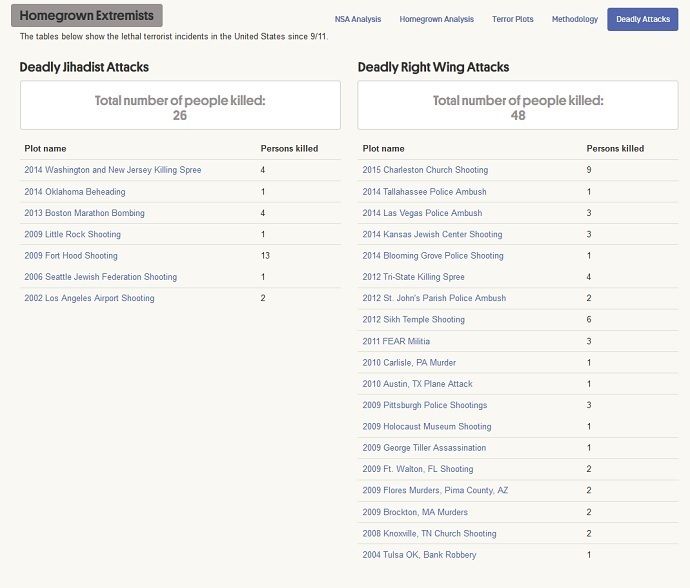 The report may even be understating the number of right-wing terrorist attacks in the US because the media often reports other, non-political motivations when the perpetrators are white, critics contend. 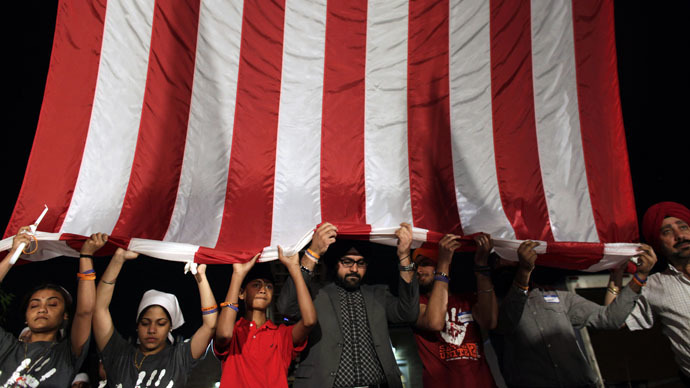 New America noted that it focused on the acts themselves and remained neutral on whether the perpetrators’ motivations were considered to be violently extreme. 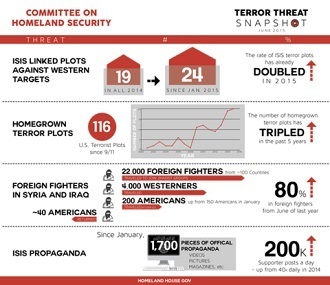 The New America database runs counter to public perception, which says that Muslim jihadists on US soil are a much larger threat to Americans. The people tasked with rooting out violent extremists and preventing attacks from occurring, however, see threats in line with what the dataset found, according to a survey about to be published. That study ‒ set to be published this week by the Triangle Center on Terrorism and Homeland Security and the Police Executive Research Forum ‒ asked 382 police and sheriff’s departments nationwide to rank the three biggest threats from violent extremism in their jurisdiction. About 74 percent listed anti-government violence, while 39 percent listed “Al Qaeda-inspired” violence, according to study authors Charles Kurzman of the University of North Carolina and David Schanzer of Duke University. “Law enforcement agencies around the country have told us the threat from Muslim extremists is not as great as the threat from right-wing extremists,” Kurzman told the NY Times. The mismatch between public perceptions and actual cases of jihadism in the US has become steadily more obvious in scholarly research, but that realization hasn’t made its way into the mainstream American conscience yet, John G. Horgan, who studies terrorism at the University of Massachusetts Lowell, told the NY Times. According to that tool, the number of homegrown terror plots since 9/11 has tripled in the past five years. The data was compiled by the committee’s majority staff.